Outside Augusta, Georgia at a military recruitment center an armed man was spotted. It seems it wasn’t his presence that created an issue with some Muslims it was his sign. That’s right! I said it – a sign. It bothered them so much that they called the FBI. Hey! We do still live in the USA where Americans can exercise Freedom of Speech, right? Where citizens can arm themselves and support our military, since Obama won’t allow our service personnel to carry guns while serving on the job like those who lost their lives in Chattanooga. Yes! That’s right. 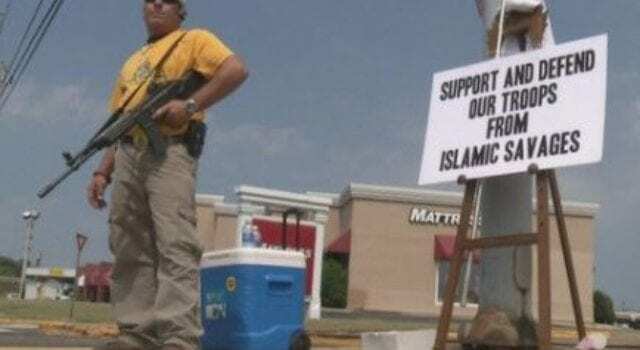 Any time a radical Islamic terrorist can come into our country and murder the lives of innocent men and women who are there to protect our freedom, but can’t protect their own lives with guns while on duty…well, I must say, I agree with Jim’s sign. Preach it baby! You Da’ Man! Chris Kyle would be saluting you too! Chris Kyle knew what they were capable of doing. He experienced it firsthand in the Middle East fighting Muslim extremists. Apparently, though some Muslims didn’t appreciate the same sentiment that I have or that Chris Kyle would have, and they were so mad the called the FBI to report Stachowiak. According to Bare Naked Islam, they “then tried to get him into the mosque in order to ‘re-educate’ him with the usual Muslim lies and propaganda about Islam being a ‘religion of peace.’” REALLY? What’s wrong with this picture? Unfortunately, Stachowiak wasn’t buying what they were selling. For Real? I don’t know about you, but I would love to have Gunsmoke’s Marshal Matt Dillon or John Wayne right about now, or even Jesse James. We would have ourselves one heck of a roundup! Yippee ki yah! Mother F**ker.